A fun analogy from Dr. Rob Holt (University of British Columbia) comparing small molecule therapy to synthetic biology. On March 6th and 7th 2018, the first national conference on synthetic biology in Canada was hosted in Toronto. Organized by Ontario Genomics and Innovation, Science and Economic Development Canada (ISED), the conference brought together over 275 students, professors, industry leaders, and policy makers from across the country, and from the UK and US. The event was split into two days, with the first day focusing on synthetic biology (synbio) success stories in Canada, and comparisons to how other countries have fostered their own synbio community. This blog post will summarize the presentations and discussions of the first day, with some additional thoughts from the SynBio Canada Steering Committee. A blog post about the second day, which focused directly on how synbio can be fostered and strengthened in Canada, will follow tomorrow. We also encourage you to read Ontario Genomic’s summary, and Dr. Shawn Lewenza’s summary on his own site. The conference was kicked off with encouraging statements from Ihor Boszko and Marc LePage, representing Ontario Genomics and Genome Canada respectively. Mona Nemer, the recently appointed Chief Science Advisor of Canada, also stated her support via video. She explained that the interdisciplinary nature of synthetic biology is precisely the sort of science she’s excited about, and that she too has a background in DNA synthesis. Replacing the usually staid nature of academic conferences, Bill Peck the CTO and Co-Founder of Twist Bioscience, was welcomed to the stage with a rousing rock intro of Smoke on the Water by Deep Purple. Bill discussed how synthetic DNA is enabling a move beyond a reliance on petrochemicals to create energy, fuel, and plastics. He also discussed Twist’s collaboration with Microsoft and the University of Washington to use DNA as data storage, which faithfully stored jazz music. He also used an interesting analogy, explaining that each human body has many orders of magnitude more information than all of the digital data hosted on Facebook. Stephen described how political leadership in the UK has been the driving force behind the country’s strong support for the field. Synbio was identified as one of eight technologies that the UK must invest in, to remain competitive in the 21st century. By betting on specific technologies, not applications, the UK government avoided “picking winners”, which is a common criticism of government-led investments. He then went on to describe the mission of SynbiCITE, which is to nucleate synbio applications in the UK. By focusing on jobs and wealth creation as a direct result of synbio investment, SynbiCITE has made a strong case for supporting synbio at a national level. An overview of synbio entrepreneurship since the launch of SynbiCITE revealed that 37 new companies had been created and sustained, receiving £13M in grants and £234M in private investment. Importantly, SynbiCITE found that these companies were specifically concentrated nearby the synbio accelerators that had been founded, showing a direct positive impact on local economies wherever synbio is supported. There were many great discussions throughout the day, but to keep things brief, here are a few quotes from the various panels. 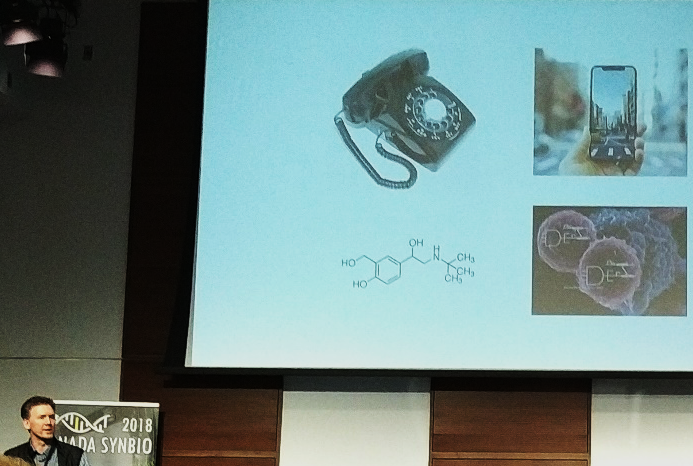 “First computing chemistry in silico…and then finding the organisms and genes which create these chemicals.” - Nathan Magarvey of McMaster University and Adapsyn Bioscience discussed his work to discover next generation therapeutics. “What if you could google the next drug?” – Ratmir Derda, University of Alberta and 48 Hour Discovery. A fun presentation involving a water bottle, showing how an entire chemical library could be rapidly screened by genetically encoding molecules. “A 100% reduction in greenhouse gases and 67% reduction in energy costs.” - Cathy Hass from BioAmber discussed the many benefits of switching from petroleum based production to biology based production of succinic acid. “A lot of work still to do understanding (cellular signaling) pathways, and then moving to building new ones.” – Peter Zandstra, University of British Columbia, discussed the current promise and challenges facing the development of new cellular therapies. “We need to build immunotherapy capability in Canada, so we are not beholden to multinational drug companies.” – Rob Holt, University of British Columbia, showcased the exciting immunotherapy studies currently being performed in Canada, and the need for a national strategy to ensure the country has the capacity to use this breakthrough therapy. Vincent Martin (Concordia University) identifying a big hurdle facing synthetic biology, which The Centre for Applied Synthetic Biology is working to solve with their genome foundry. “What are you going to build (with DNA) and why?” – Leslie Mitchell from NYU and the Sc2.0 project imparts the lessons she learned from designing custom organisms. “We work to engineer complex phenotypes.” – Vincent Martin from Concordia University on the many applications of the genome foundry at his institution. He specifically stressed the importance to engage in the GPWrite project, and wants to host a meeting in Canada in August 2018. Taking an idea beyond the lab is daunting, especially when developing a business around it. Ken Nickerson from OMERS Ventures imparted advice for scientists/entrepreneurs, stating that although it may seem that entrepreneurs are beholden to investors, it’s the investors who are desperate to find good ideas to support. “What does it mean to scientists to innovate responsibly?” – Jennifer Kuzma, Visiting Research Chair at the University of Ottawa, poses a challenging question to the audience. “90% of surveyed consumers had high likelihood to buy. The other 10% wanted chocolate dip, or red ones.” - Neal Carter from Okanagan Specialty Fruits discusses their Arctic Apples product, which are apples that do not brown. The final panel of the day was a showcase of the diverse synthetic biology start-ups from across the country. Bougimil Karas, CEO of Designer Microbes discussed their work developing proprietary vectors for cloning and maintaining large DNA fragments. They’re interested in fostering year-long collaborations with academics, and are particularly interested in soil microbes. David Lloyd, CEO of Fredsense posed the question “do you know what’s in your water?”. There’s a $22B market for chemical testing, but it usually takes days to get results. They’re working to create modified organisms that can detect contaminants within an hour. Hans-Joachim Wieden showing off the impressive synthetic biology community at the University of Lethbridge. Hans-Joachim (HJ) Wieden, Director of SynBridge discussed the need to “support a community of practice”. He has helped create a space for synthetic biology students, enthusiasts, and entrepreneurs to test their ideas in a real lab. SynBridge is part of a greater synthetic biology community, centered at the University of Lethbridge. Justin Pahara, CSO of Amino Labs talked about how they’re interested in “not the what but the who of synthetic biology.” Amino Labs creates kits for after school programs and public workshops to foster a do-it-yourself style of education. Interestingly, he stated that New Brunswick has by far the most active hands-on synbio community in Canada. Kevin Chen, CEO of Hyasynth Bio showcased their efforts to create yeast which produce therapeutic cannabinoids. Through synthetic biology, they aim to tackle the $6B blackmarket for cannabis, and address the issues of scale facing the extraction of cannabinoids. Leo Wan, CEO of Ranomics discussed their gene library service, offering targeted mutagenesis for up to 15 kb of gene. This aims to revolutionize biologics development, and how we understand how proteins function. Pratish Gawand, CEO of Ardra Bio showed how natural ingredients can be obtained by engineering cells to produce them, rather than extracting them from crude oil. Instead, all it takes is the right engineering cell and some sugar. It should be noted that these seven start-ups represent the entirety of the current synbio entrepreneur community in Canada. This is compared to the 37 companies that have been formed in the UK, thanks to dedicated financial support from the UK government. Canada clearly has a lot of catching up to do, and this conference was a step in the right direction. In many cases, this was the first time that members of the Canadian synbio community were meeting face-to-face, which is key to develop strong research and business relationships going forward. The support voiced throughout the conference by policy makers and granting agencies was very encouraging, and SynBio Canada is excited to contribute to making a stronger synbio community. The second day of the conference, a smaller closed-doors meeting, directly focused on what Canada must do to support synthetic biology at a national level. Members of the SynBio Canada steering committee participated in these discussions, which will be summarized in a future blog post. The SynBio Canada Steering Committee would like to thank Ontario Genomics and ISED for hosting an engaging conference! Stay tuned for our summary of Day 2.